Posted on June 14, 2013 . 5 Comments. There is no denying the benefits of the hard style kettlebell jerk. Whether your goal is power, strength, hypertrophy, or endurance, these can all be accomplished by training the hard style jerk. There are various drills and exercises to improve the hard style clean and jerk, but for today and for the sake of simplicity, I will only be discussing how the front squat can improve your clean and jerk. The body stays zipped up. Basically it is performing a plank, but in the standing position. The elbows are connected to the rib cage and the kettlebells become part of your body. The elbows should be pointed toward the ground. If the elbows point toward anywhere else, you are most likely disconnected and will experience a power leakage later in the lift. The bar should rest slightly behind the collarbone, on the front delts and slightly touching but not choking your neck. The elbows should be at least be perpendicular to the floor. This is where the body can handle the heaviest load, and this angle allows you to stay connected to the bar. In both instances, the implement becomes one with the body. A good rack position, either with the kettlebell or the barbell, is the foundation to technical proficiency. The heels come off the ground. The elbows shoot off the ribs and disconnect from the torso. The shin angles excessively forward when dipping. If any of these happen, you are robbing yourself of power. In the photo below, you can see glaring differences in rack positions. The photo on the left has major technical flaws while the photo on the right is technically sound. 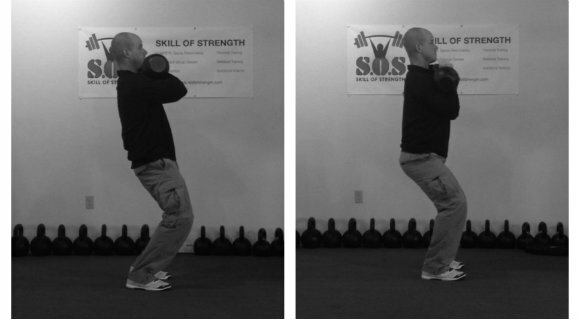 The kettlebell jerk – Left: technically flawed; Right: technically sound. If your first dip looks like the photo on the left, the barbell front squat might be exactly what you need. Why Does the Front Squat Help the Clean and Jerk? The groove of the first dip in the kettlebell jerk and the barbell front squat should be almost identical. This is exactly why a solid month of front squats will do wonders for your jerk. If you go heavy enough, you cannot cheat the front squat. There is no way the heels will come up, the shin angle needs to be spot on, and the bar needs to rest perfectly on the shoulder girdle. These are the reasons why the front squat is your key to a better kettlebell clean and jerk. In the photos below, you can see that the shin angle, hip and and torso angle are very similar between the movement done with kettlebell and with the barbell. There are a few small differences, but overall they demonstrate the same proper mechanics for optimal torque and power production. Once you start programming front squats into your routine, I can pretty much guarantee the bells will start moving with greater ease in your jerk. 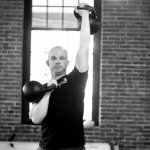 Comparing position using the kettlebell versus the barbell. I would recommend the Easy Strength approach when adding the front squat into your current program. Train the front squat every session, keeping the reps at ten total per day. Gradually increase the weight. Go heavier when you feel good and never miss a rep.
Mike is the founder and owner of Skill of Strength, a performance-based training facility located in Chelmsford, MA. In his twelve-plus years as a personal trainer and strength and conditioning coach, he has trained clients of all ages and abilities including several collegiate and professional athletes in the MLS, NFL, MLB, UFC, Bellator MMA, and various mixed martial arts organizations in New England. Mike began his career at a medically based training facility where he worked closely with physical therapists, Certified Athletic Trainers (ATCs), acupuncturists, and chiropractors. 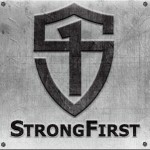 Mike holds the following certifications: Certified Personal Trainer through the National Strength and Conditioning Association, StrongFirst Team Leader, Strongfirst Barbell Instructor, USA Weightlifting Sports Performance Coach, USA Track and Field Level 1 Coach, Functional Movement Screen Certified, and Certified Kettlebell Functional Movement Screen Specialist. In addition, Mike works as an assistant staff instructor for Functional Movement Systems. Thank you for this great post, we are currently working on the Clean & Jerk. great post and very important tip.